Homicide rates in Mexico increased between 2010 and 2012, though there is some evidence that they are now beginning to fall again. Did the pattern of homicide rates also change since 2010? The second map shows the pattern of intentional homicides in Mexico in 2012. (Note that the values on the key are slightly different to reflect the increase in Mexico’s average (nationwide) homicide rate between 2010 and 2012). At first sight the pattern in 2012 look pretty similar to that for 2010. The adjoining states of Sinaloa, Chihuahua and Durango continue to have rates well above the national average, as does Guerrero further south. However, the homicide rate in Nuevo León, which was “well above average” in 2010 has declined somewhat to “above average” in 2012. Since 2010, the north-eastern state of Tamaulipas has seen its homicide rate increase from “above average” to “well above average”. Perhaps more significantly, the border state of Coahuila has witnessed a jump from “below average” to “well above average”. Homicide rates in the two north-west border states of Baja California and Sonora have fallen since 2010 to “below average”. Elsewhere, homicide rates have increased in both Zacatecas and in Colima since 2010, while rates in Veracruz have declined to “below average”. 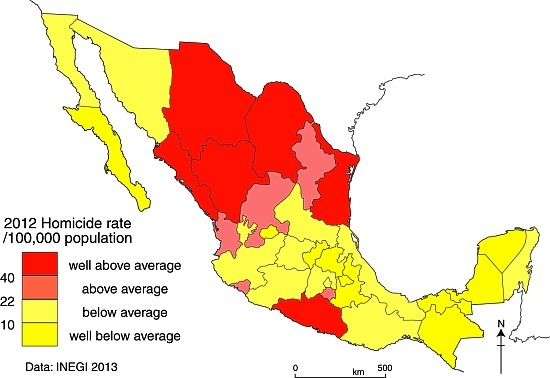 The shift in Veracruz means that a broad swathe of southern Mexico, including the Yucatán Peninsula, Oaxaca and Chiapas, now has a homicide rate “below average” or “well below average”, good news for tourists headed for Oaxaca, Cancún and the Riviera Maya! On a more cautionary note, the state of Michoacán has seen increased violence in 2013; its homicide rate is headed upwards. The changes in pattern of homicides between 2010 and 2012 are partially attributable to the “zones of contention” between rival drug gangs. For instance, the Knights Templar cartel (currently thought to be Mexico’s third largest cartel, behind the Zetas and the Sinaloa cartel) has its origin in Michoacán but has expanded its geographic influence very rapidly in the past few years. Equally, the capture of key cartel leaders in recent years seems to herald increased violence as rivals compete to fill the perceived power vacuum left behind. This unfortunate outcome from the arrest of leading cartel operatives is continuing this year following the capture of Zeta leader Z-40.